Thousands of motorcycles are stolen every year in the United Kingdom, and only about 4 in 10 of these bikes are recovered. Even if you are with an excellent insurance company, it is unlikely that you will be able to reclaim the true value of your bike, and you will never be able to compensate for the loss of the shared experiences which you would have had with it. It is therefore essential that you take every possible step to protect your motorcycle against theft. A recent survey found that about 75% of motorcycle thefts in the United Kingdom occurred from commuter parking bays, however the majority of commuters confessed that they did not take enough time to secure their bikes before work. This means that these commuter bays are rich pickings for bike thieves. Making sensible choices about where you park your bike and how you secure your bike is the first step towards protecting it. Motorcycles are obviously a lot easier to steal than cars are, because you do not normally have to forcefully gain access to the bike before getting to the ignition. Simply pushing a bike away without turning the engine on is actually one of the most common forms of theft. Thieves will move the bike to a garage or more private space where they can do more extensive work on it so to try to change its identity. Therefore, it is important that you take every reasonable step that you can to stop the vehicle being moved. 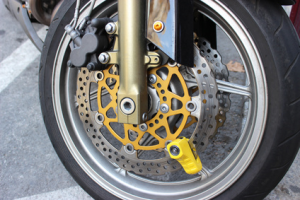 Fit a heavy duty chain onto your rear wheel to stop the wheel from being turned. A disc lock is also a good idea. Fit a tracking device to your bike, so that if it does go missing, you will be more likely to get the bike back. GPS trackers can help to lead the police to the whereabouts of the criminals and will help them to reclaim your bike for you. In many cases, the bike will be returned to you as soon as possible, although the police may want to keep it for a short time period for evidence. If thieves are concerned that the bike may have a tracking device fitted to it, they may park the bike somewhere unconnected to them for a few days, so that they can see whether or not the police come to reclaim the bike. Although this may not lead to any arrests being made, at least you will be able to get your bike back. Having a tracking device fitted to your motorcycle can also help to reduce your annual insurance premium. If you do have a tracking device fitted to your motorcycle, then you should check it regularly to make sure that it is working properly. Mark your bike overtly and covertly in several different places. Thieves are known to be less likely to consider taking a bike which is easily identifiable, because they would have to do more work if they wanted to sell the vehicle on. Ultraviolet pens are a great way to mark individual components to reduce resale opportunities. Although you can’t always control where you have to park your bike when you are out and about, you can take steps to improve where your park and store it when you are at home. If you have the available resources then a locked garage is the ideal place. It is even better if you are able to fit an alarm or remote monitoring system to the garage. Domestic security cameras are available which are turned on by motion and which can be watched from a smartphone or computer, and some are surprisingly cheap and give good value for money. If you discover that your bike has been stolen then you should report the incident to the police at once. You will be asked to give as much detail as possible about the bike and where you last saw it. Some people find it helpful to take a picture of their motorcycle so that they can show this to the police if necessary. You should also report the incident to your insurance provider. Prompt action can help to catch the criminals and may speed up your claim.